Based at the Meadow Road Youth Centre, the Senior Citizens Enterprise Woodwork Group, in Dudley, is a group for older people who are interested in woodwork. It’s a fun and friendly environment offering older people a place to learn new or develop existing woodworking skills. It’s also a great place to find new friendships. The group has 23 members in total. Some members live on their own, some are widowers, some just like to get out of the house, make something and put their skills to good use! The oldest member, Ken, is 93 years old. ‘Fed up with looking at four walls? Then come and look at ours instead!’ That’s the motto of the Senior Citizens Enterprise Woodwork Group. The wood workshop is fully equipped with modern tools and machinery. There really isn’t much that the group hasn’t made, and they’re always on the lookout for new projects to keep them occupied. They’ve kindly created cosy homes for many of the animals at Dudley Zoo, a castle hideout for the zoo’s female guinea pigs, a hotel for rabbits, bird, bat and red panda boxes. They’ve even built penguin boxes – they tell me that they have successfully bred since, so must have done a good job making them feel at home! Members have also kindly given their time and skills to build a variety of bird habitats for the Midland Metro Alliance which will be installed along the Wednesbury to Brierley Hill route for the Midland Metro. It’s hoped that the bird boxes will attract a wide range of nesting birds. They’ve built a bench for Acorns Children’s Hospice, nest boxes for local schools and they’re now looking to build Pine Marten boxes for an RSPB site in Shropshire. The group acquire offcuts of wood donated by local businesses which enables them to build all of the items, these materials would otherwise have gone to landfill. They have even rescued supermarket trolleys from the canal and used the wheels to make wood replenishing trolleys that fit snuggly under the workbenches. Steve is one of the youngest members of the group, he joined when he was 63 and mainly makes things for the family like shelving and benches. He tells me that people like to come to the workshop because they enjoy the camaraderie and they like to have a good laugh. A couple of members don’t look forward to the Christmas holidays as it just imposes on them coming to the workshop! They’ll open up again as soon as Boxing Day arrives, as long as there are two people in the workshop, for health and safety reasons, they will happily come in over Christmas! Steve contacted Dudley CVS to get support to apply for a Dudley Community Forum Grant of £550. The application was successful, helping them to purchase sanding disks, belts, saw blades, machine saws and new router bits. They’ve also received £900 from Age UK, which they have used to buy a new router machine. Dave is one of the founding members of the group, he’s made things including rocking horses and dolls houses. It usually takes him about 3 months to make a rocking horse which is made in blocks, glued together and then carved and painted. He’s also carved a shark out of wood, which sits on his fireplace at home. Chairman Mick, is highly skilled on the woodturning lathes, he’s made fruit bowls and pens. He’s even made a beautifully carved walking stick. Dave and Derek have a background in upholstery. Derek recently made an intricate money box. He enjoys coming to the workshop, but doesn’t like Thursdays much, as that’s when the workshop closes for the weekend! Ken, the oldest member, is making clocks for his sons out of an old sideboard that belonged to his parents. Bruce makes detailed wooden toy trains, plains and trucks. He finds his inspiration in woodwork books. George, the treasurer, likes to make boats with sails. He keeps them in his large shed, apparently, you have to go in sideways because of the number fabulous boats, lifeboats and submarines he has made. All members are extremely skilled and talented. Some had skills before, some hadn’t, many have learnt skills from each other. All of their items are beautifully made and finished to a high standard. The group originally started in the early 2000s when a few people were faced with redundancy from local businesses. It was suggested they go on other courses to re-skill, one of those was a woodwork course at Dudley College. When that closed down the group moved to Mons Hill in Dudley, then amalgamated with another group from Brierley Hill, it was then that they moved to Meadow Road Youth Centre where they have been based for over a decade now. They still use the original machinery that was donated by Dudley College over a decade ago. The group has recently become a member of UK Men’s Sheds Association. Men’s Sheds provides support and guidance to individuals and groups across the UK, raising awareness of the social and health benefits of Men’s Sheds in reducing isolation, loneliness and in empowering local communities. 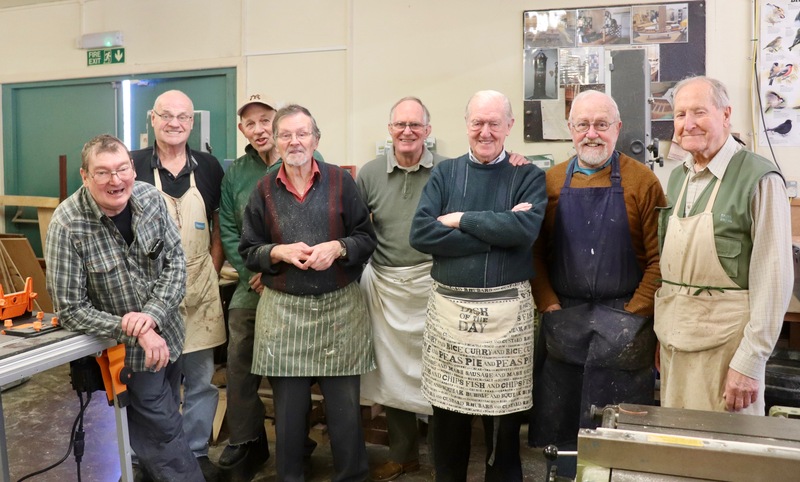 Men’s Sheds supports individual groups to connect with new members of the community. They also provide advice and guidance on starting up and running a shed providing practical information guides, example documents and toolkits on topics such as registering as a charity, insurance, funding, sourcing equipment and venues, and volunteer recruitment.